I am a HUGE fan of Spark. And by fan, I mean the admiration for/admirer definition. For many years, each Sunday during my long run, the latest “Spark” podcast continues to keep my mind off the pain of running. In fact, I associate some of the things I have learned on Spark with specific geographical locations. One afternoon, I dragged myself out for a run in Arrowhead Provincial Park and listened to Clay Shirky discuss Cognitive Surplus with Nora Young, and how we could be better using our TV time. 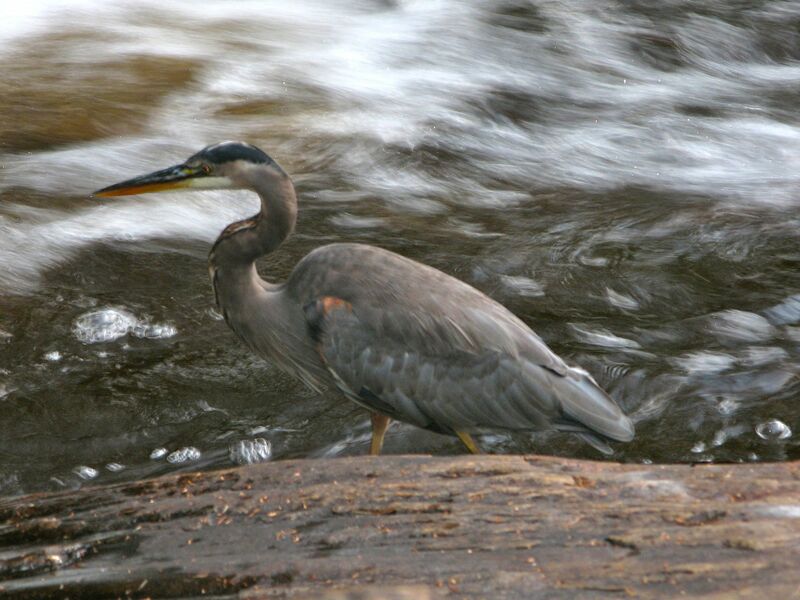 I couldn’t help think about how true this was when I happened on a Great Blue Heron fishing in the rushing water, something I would have missed if I had not been motivated to do that run. Thank you Clay! 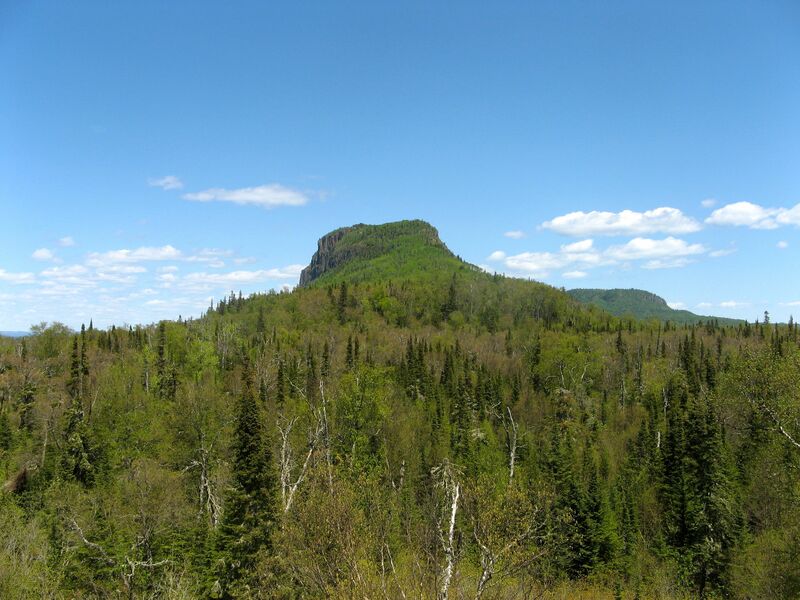 I remember looking up at the cliffs along the “feet” of the Sleeping Giant (in Sleeping Giant Provincial Park) while listening with wonder as Nora chatted with Austin Seraphin about how he uses an iPhone without being able to see. I can barely use mine most days, and I can see the screen. But never in all of those years and kilometres of listening did I ever think that one day I would be ON that show! Apologies to Bill – his cards are normally a lot cleaner. This one has been carried around for awhile. 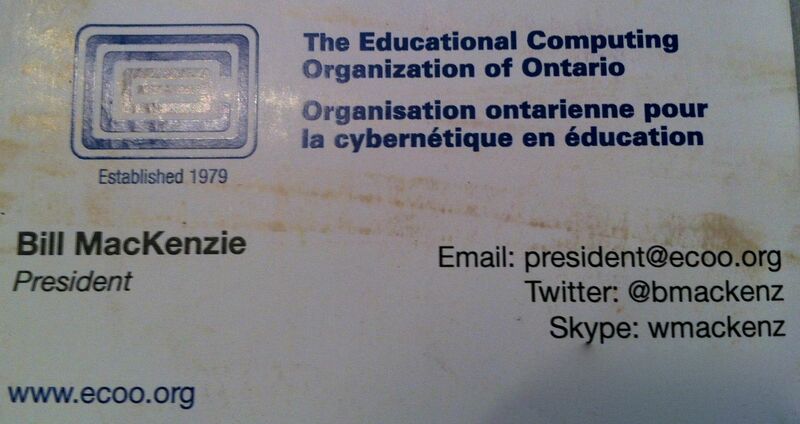 Imagine my excitement when I received an email from Bill MacKenzie, President of ECOO (The Educational Computing Organization of Ontario), asking if I would be able to be part of a panel discussion with Jaime Casap, Michael Fullan, John Seely Brown at the #ECOO12 Conference, a discussion to be led by Nora Young, and recorded for a future Spark broadcast! This was an opportunity not to be missed! But excitement soon turned to sheer terror. Seriously? 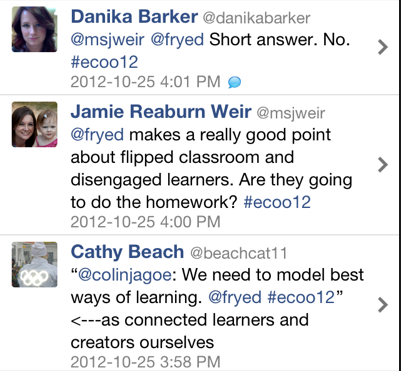 What do I have to contribute to a discussion with four experts in the field of educational technology? I was reminded by one teacher at my school that I am always asking them to share without fear. Now was my time to model that for them. Just the process of reading about the four other people on the panel and the work they have done was a rich learning experience. Their work has contributed to an enhanced understanding of the place, purpose and efficacy of educational technology, and I will be sharing this learning in future postings. But back to the story. 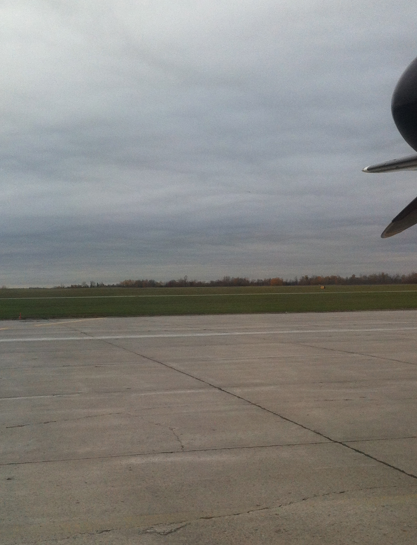 My journey to #ECCO12 began when I left my home on the north shore of Lake Superior at 4:30 a.m., arrived at YQT (Thunder Bay International Airport) for 5:30 a.m and boarded the plane for the 1 hour 45 minute flight to Toronto at 6:10 a.m. Our ETA at Billy Bishop Airport in Toronto was 8:25 a.m., plenty of time to get to Richmond Hill for our 3:30 p.m. panel discussion. Upon arriving in Toronto, we discovered that both airports were fogged in. 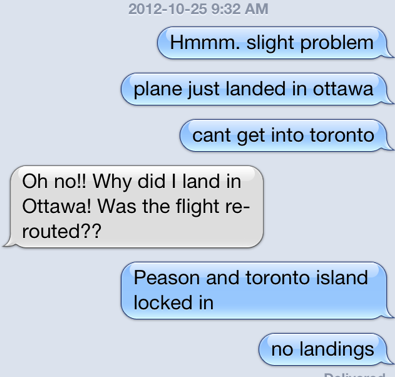 After much circling, we were informed that we were being rerouted to Ottawa. No panic. It was still early…. Chatting with Katie @ECOO while on the tarmac at the Ottawa airport. 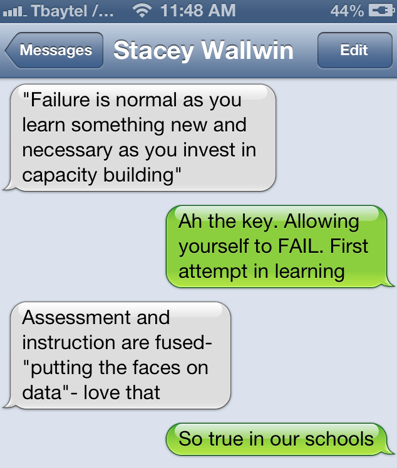 Luckily my very good friend, colleague and endless source of support, Stacey Wallwin, was attending the Michael Fullan session at ECOO, and texting with me in the backchannel. If I couldn’t be in the room, at least I could still feel like I was participating. 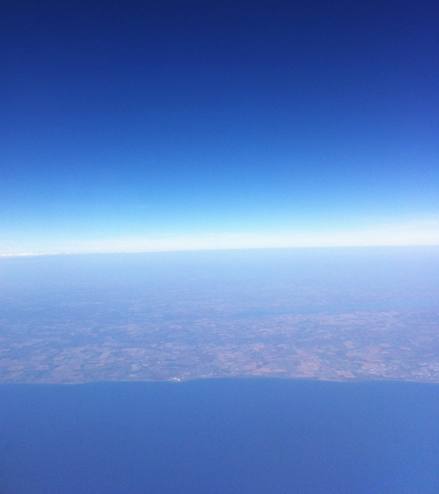 After a few hours, we were back in the air and heading for Toronto. But… we kept circling and circling and circling over Port Hope and Cobourg. I was beginning to get very nervous. Finally we landed. It seemed to take forever to gather our luggage, cross on the ferry and find transportation. My travelling companions took my luggage for me and an struck out for Richmond Hill. Stacey met me at the door with cookies, water and aspirin! I had not had food, water, a bathroom and even worse, no coffee for almost eight hours! This is not how I envisioned my debut on CBC Radio! Poor Doug Peterson, who you will hear introducing Nora Young on the podcast, was so helpful in getting me there, but I caused him some headaches too. The audience was ready as I arrived. And finally seated! Whew that was close! 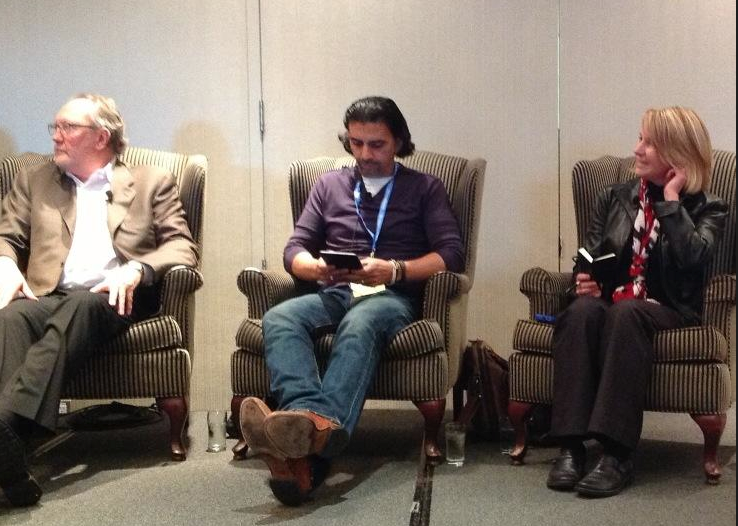 Here is a Twitter version of what I was seeing during the panel discussion. Huge thanks to Doug Peterson and Bill MacKenzie for inviting me to participate and supporting me in preparing for the discussion. Thanks to Brenda Wiskin and Holly Stortini for keeping me calm on the plane and transporting my luggage to my hotel for me. Stacey Wallwin (eLC, SGDSB), a huge thanks to you for always dropping whatever you are doing and coming to my aid. Nicki Morden-Cormier (SEF Lead, SGDSB), thank you for all your encouragement and advice, and Dave Tamblyn (Director, SGDSB), thank you for your support and all you did to promote the event. It was a huge treat to finally meet f2f with Brenda Sherry, Peter Skillen, Allana Callan and Peter McAsh. 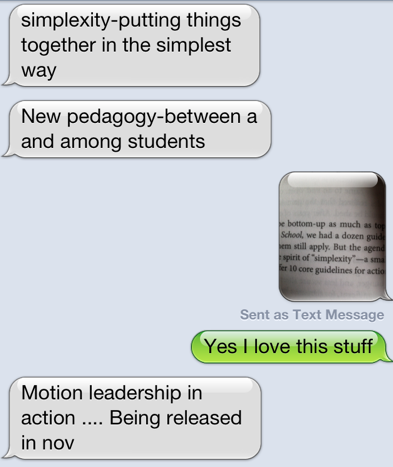 I look forward to more learning together. And those hugs from my Unplug’d12 friend Lisa Neale helped hold it all together. And for all their support during the event I thank Colin Jagoe (who I did my first ever online-prepared presentation with – no point in ever meeting before presenting together! 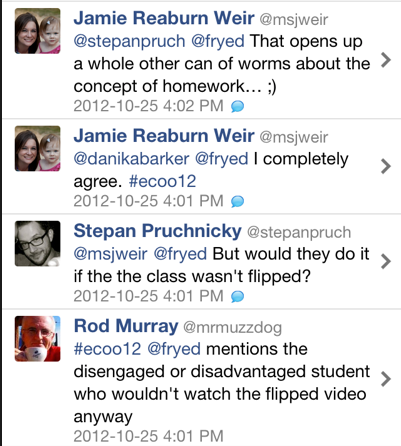 ), Zoe Branigan-Pipe (edtech superstar), Danika Barker (unplug’d roommate and teacher-model extraordinaire), Rod Murray (more unplug’d connections), and so many more of my Twitter colleagues – Grant, Jamie, Stepan, and Cathy. Martha Walli and Cindy Carr, superstar former ReLCs who I have learned so much from, and my NeLC support network – Katie Maenpaa, Brandon Grasley, Teresa Stevenson – thanks for being there. And to Nora Young, what an honour to finally meet you and speak with you. I continue to admire your work. John Sealy Brown, I am sorry to have missed your keynote, but your words during the discussion have been a catalyst for some new learning and research around identity – a topic I had not considered before. Jaime Casap, I look forward to future conversations with you. 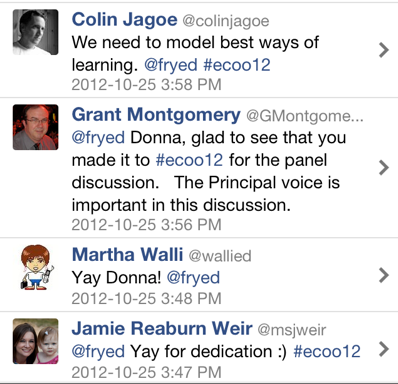 Michael Fullan, just to be on stage with you was an honour. Your work has influenced education in Ontario in such a positive way, and “Professional Capital” honours the teaching profession in a way that is essential if we are to change the system. Colleen Rose, watching the livestream and sending so many positive vibes, I wish you could have been there. Next year for sure. The discussion clip on Spark has already “sparked” so many conversations. Let’s keep them going. Together we can make all schools places of learning and support for all children. What a great story of sticktoitiveness, Donna. You left out the part of your Rockstar performance bringing the Ontario Educator voice of reason to the discussion. I think everyone in the hall identified so closely with your observations and comments. We couldn’t have chosen a better panelist. From the bottom of my heart, thank you so much for accepting our invitation to be on the panel. I’ll never forget your only request – a glass of water! I’m sure you were so parched having flown in circles all day! Donna, you rocked it, totally. I’m sorry I didn’t get to see you afterwards. So many unplugd12ers were there. Great reflection! 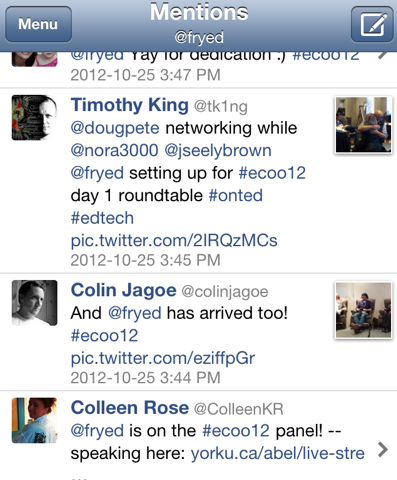 We weren’t sure what was happening when we hadn’t seen you at ECOO all day! Your voice added so much to the conversation, grounded it in the reality of daily life as an educator. It was a great discussion, and I look forward to hearing the Spark version again!